Video game adaptations haven't traditionally been huge box office hits, with only one movie, 2001's Lara Croft: Tomb Raider, earning over $100 million domestically. 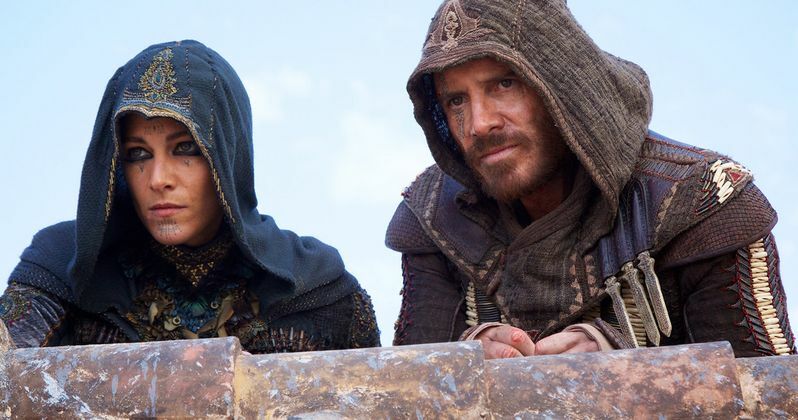 That tradition of box office failure may change later this year with the highly-anticipated release of Assassin's Creed, hitting theaters on December 21. Yesterday, Ubisoft's Azaizia Aymar shared the final photo from the set, revealing that production has wrapped on this adaptation. Filming on Assassin's Creed began in Malta this past September. The story is about a revolutionary technology that unlocks genetic memories. Callum Lynch (Michael Fassbender) experiences the adventures of his ancestor, Aguilar, in 15th Century Spain. Callum discovers he is descended from a mysterious secret society, the Assassins, and amasses incredible knowledge and skills to take on the oppressive and powerful Templar organization in the present day. Michael Fassbender recently spoke about the production in an interview with Wall Street Journal, where he had this to say about the production. "It was great. It was a huge learning experience. To be a producer on it as well was very educational. I think we've got something special. I think we've done something original in this genre. He is an outsider. He's been institutionalized from his early teens. He's a little bit of a lost soul of sorts. He starts to identify [his] lineage and where he comes from in a way." Marion Cotillard, Ariane Labed, Michael K. Williams, Carlos Bardem, Denis Menochet, Brendan Gleeson and Jeremy Irons round out the supporting cast for Assassin's Creed, which started production this past August in Malta. It has already been confirmed that this adaptation will be set in the same universe as the video game series. Justin Kurzel directs from a screenplay by Scott Frank, Bill Collage, Adam Cooper and Michael Leslie. Do you think this adaptation could set the stage for a new wave of hit video game adaptations? Take a look at the new photo below, and stay tuned for more on Assassin's Creed, which hits theaters on December 21, 2016.